Akata Witch by Nnedi Okorafor is like so many coming-of-age stories before it, and yet it’s completely different. We recognize the heroine: she’s a girl who’s never quite fit in anywhere, who stands out even in her home. We recognize the plot: she and her friends are the keys in stopping a threat that looms over the entire world. But we recognize little that comes in between, that fills the edges, rounds out the corners, builds and breathes in the lush world. The bones of the story are recognizable, but everything else is unique. 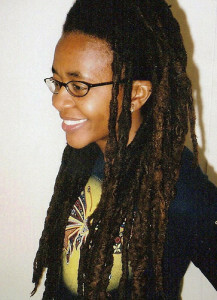 Sunny Nwazue is Nigerian and American. She’s not Nigerian-American; she was born in the United States to two Nigerian parents with two Nigerian older brothers, but when she was nine her family moved back to their home country. She’s also an albino: although her bone structure and facial features are West African, her hair is blonde, her eyes blue, and her skin pale. She sticks out everywhere and fits in nowhere. Akata Witch isn’t the story of Sunny finding the magical world to which she truly belongs. Sure, when her magic is awakened within her she finds what she’s been missing all along. But even within the magical community she’ll always stand out: for being an albino, for being a Free Agent (a magical person raised by non-magical people), and even sometimes, for being female. Instead, Akata Witch is the story of Sunny growing to accept who she is; of pulling all her seemingly disparate pieces together and building herself into a harmonious whole. She’s aided in doing so by Orlu, her classmate, and his neighbor Chichi. They awaken the magic inside her, draw her into the world of Leopards (magical people), and seal her in a binding pact to keep her abilities and new knowledge secret from Lambs (non-magical people, including her family). The three are made four by Sasha, an African-American sent to live with Orlu’s family for causing too much trouble in America. Together, they’re a unit. They train and travel together, and then they learn their shared destiny. The elders of the Leopard community tell them that they’ve been brought together as a coven because they’re the ones who must stop Black Hat Otokoto. Black Hat is a serial killer plaguing their town. He abducts children and the few that are found alive are mutilated, missing various body parts. Black Hat is a Leopard himself, and he’s sacrificing the children in a ritual that will release an ancient evil. This evil will brings world-ending destruction, one Sunny saw in a vision for herself in the first pages of the novel. That bit’s familiar. Even the climax, in common young adult (YA) fantasy form, feels a bit sudden or rushed. But everything else about the novel is new. It’s vivid, alive, and imaginative at every turn. The world’s rich population spills out from the pages, taking many of the hallmarks of the fantastical coming-of-age story and breathing new life into them. Sunny lives at home, and must sneak out on the nights that she has her magic lessons. She gets to explore the magical community of Leopard Knocks, one from which she’s no longer sheltered. Young Leopards are treated like adults. They are taught the rules and expected to follow them. From the beginning they’re given access to dangerous magic, and if they break the rules, or travel down a path they’ve been told is too steep for them, they alone are left to answer for the consequences. This is a world brimming with delight and danger. Magical bugs flit through Sunny’s room, crooning her lullabies or building works of art for her to gaze upon in the morning. She can let her true face free, and dance, light-and-even-footed, along to the music it brings. But it’s also a world of bloodthirsty sports, of masquerades: within the world of the book the true, spirit-world equivalents of the African tradition. In Akata Witch said spirits can be called and unleashed, and they wield a terrible power. Okorafor’s writing style is also fresh and fun. Chapters serve a purpose, not a particular length. Some are only a page long, others twenty or more. They represent stages in Sunny’s journey, little glimpses into her or of the realizations she makes about herself. As a Free Agent, she’s just catching up on the world of magic, unlike hereditary Leopards who are raised around it. She’s given information on a need-to-know basis, or sometimes not even that; so readers learn about the world as Sunny does, rather than drowning in exposition. One tool that helps both us and Sunny is Fast Facts for Free Agents, a guide to the Leopard world that Sunny reads, and sections of which precede the chapters in the first half of the book. Also scattered throughout the book are words and phrases in Nsibidi, an indigenous Nigerian ideographic language that Sunny begins to learn through the course of the novel. In some ways, we travel alongside Sunny. All of this vibrancy, both in the world and of how it’s written, is built around Sunny’s own journey of self-acceptance. She’s faced with many of the uglier parts of the modern world: the sexism still prevalent in society, of the egotistical dominance of Western culture, of the tension between African Americans and Africans. That last one even plays in the book’s title; “akata” is a West-African word meaning “fox” or “bush people.” It’s used as a derogatory term for those with African heritage born abroad. 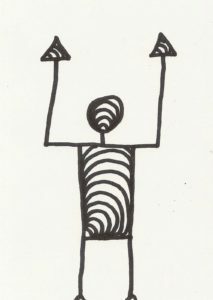 A Nsibidi symbol, meaning “This Is All Mine,” used in Akata Witch. 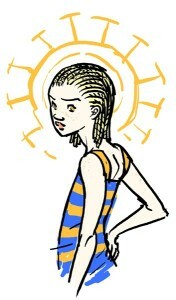 Sunny excels at soccer, but she could never play except at home in the evening with her brothers because, until her magic is awakened, the full sun damages her skin. When faced with her first opportunity to play, others don’t want to even give her the chance because she’s a girl. She and Sasha aren’t always taken seriously, or are looked down upon, for being American. But Sasha couldn’t mature in America because the country didn’t know what to do with a young black man who liked to buck authority. The American magical capital in New York is biased toward Western magic, so another society has formed in South Carolina. Even the books Sunny reads, like Fast Facts for Free Agents, are derisive toward Free Agents and toward women. All of this informs Akata Witch, but the novel isn’t trying to make a statement about it, unless it’s a statement of fact. It’s just one more thing that makes the world real, that Sunny must deal with and overcome in her path to growing up and growing wise. Akata Witch is essential reading for any lovers of fantasy, of coming-of-age stories, or of YA literature. It stands entirely on its own merit, but it’s also a YA fantasy novel set in modern-day African infused with African mythology, and that’s just something we don’t see on American bookshelves. It’s wrong that within the fantasy genre, there are so few non-Caucasian leading characters. I can think of almost none that are African (there are already far too few that are dark-skinned; there’s Earthsea‘s Ged, but he’s in a fantasy world that still feels more European than African). There needs to be more. The best thing we can do to facilitate that is to talk about it, to read books like Akata Witch, and to ask for more. We need to whet a widespread appetite. Akata Witch is fantastic for all of its own reasons: for being a fun, engaging, YA coming-of-age-fantasy. It’s an ideal place to start. Akata Witch was released in 2011, so you should be able to find it at your local library. Hardcover and Kindle editions are also available on Amazon.